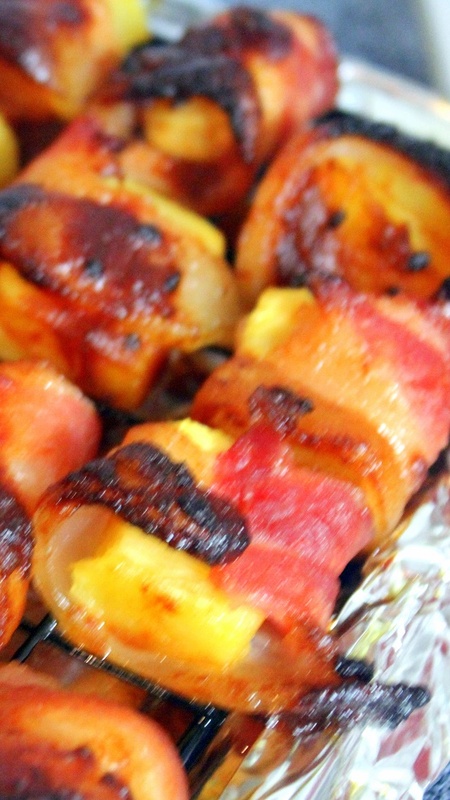 Oh Boy, Bacon wrapped anything! But this isn't just any bacon wrapped appetizer. 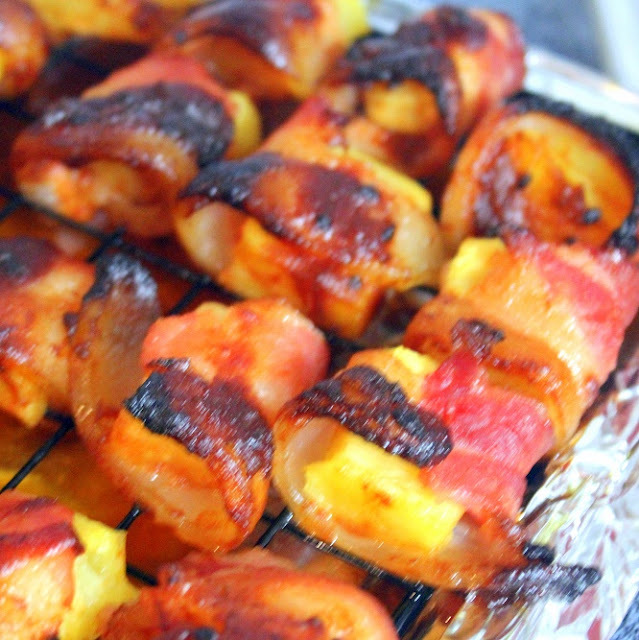 This is my very favorite bacon wrapped appetizer I made this year. Hands down, these are terrific. The Sriracha sauce is sweetened with a bit of Brown Sugar. This adds a bit of heat/sweet candy/hot flavor to the bacon. Sriracha, of course, is that beautiful colored amazingly spiced hot sauce with the famous rooster logo. 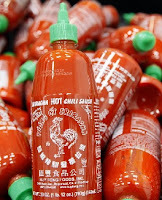 Those in the know think Sriracha is among the best of it's kind, with a following in the hundreds of followers that worship at the altar if Sriracha! 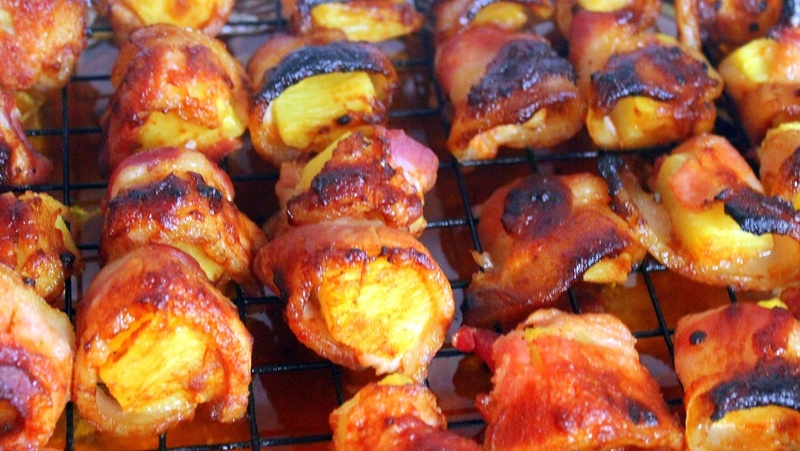 The naturally sweetness of the pineapple is ramped up as the bacon cooks around each piece. Making this hot, sweet, spicy, juicy amazing combination nearly that one perfect bite! 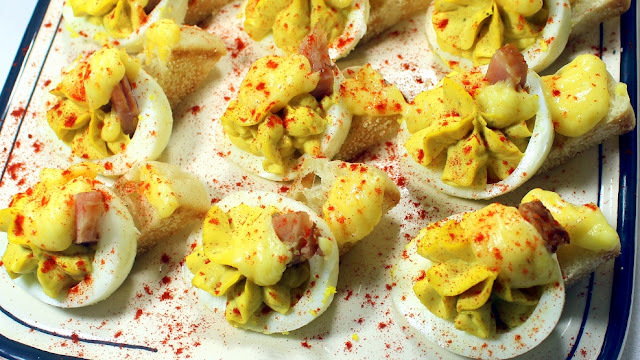 I served up a platter of these at a recent party along with a couple other platters of appetizers. BY FAR these were the first empty plate. 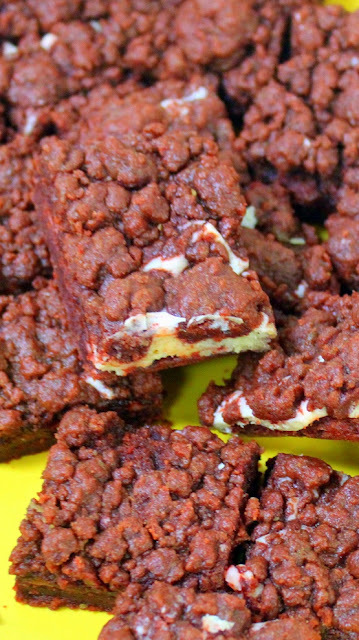 People loved the combination of tastes as this became the talk of the party with many requests for the much too easy recipe. Cut each bacon strip into 3 equal size pieces. Line a cookie sheet with foil and place a cooling rack on top of the pan. This will allow the bacon to crisp on all sides. Mix the Sriracha Sauce with the brown sugar. 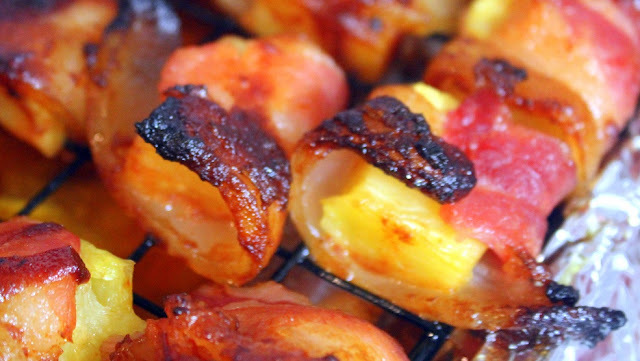 Wrap each Pineapple piece in one of the cut dipped bacon pieces. Bacon will overlap by a fraction of an inch. Place the tot seam side down on the wire rack. Repeat with remaining bacon, sauce and pineapple. Bake for 20 minutes, check the crispiness of the bacon (I check the color). Continue to bake at 5 minute intervals until the bacon is a beautiful crispy cooked bacon color. Watch carefully as the added brown sugar will burn if cooked too long (A little crispy bit is perfect, call it caramelized. Add an attractive toothpick to each and arrange decoratively on a serving platter. 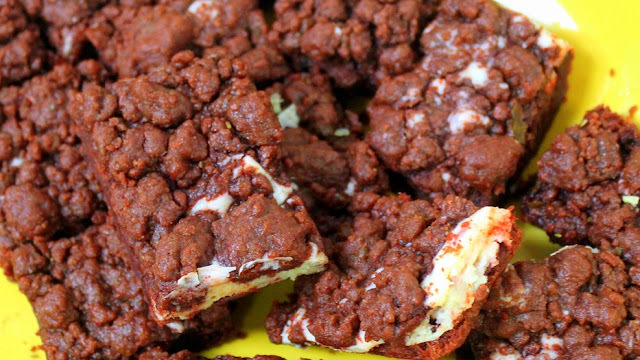 But not just any bar cookies, these have several things going for them. First of all is the legendary Red Velvet chocolate unique flavors. Slightly Cocoa Chocolate flavor with hints of tang makes this something special. The look with the red tinge adds to that special-ness. 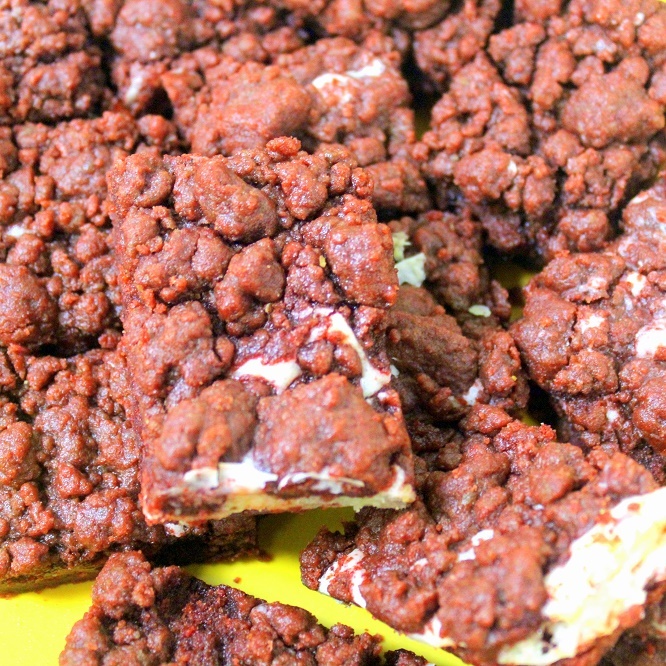 BUT, best of all, the normally complicated Red velvet recipe is replaced with a couple of Store bought cake mixes. My large market just started carrying these mixes, but I was able to find them on Amazon for you Amazon Prime members that get free shipping (see link below). 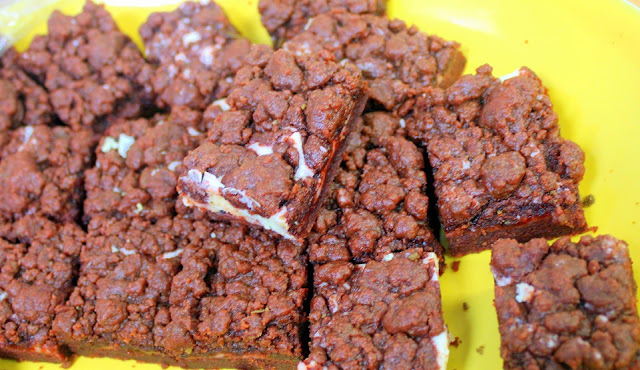 There are three layers to the bars... an almost chocolate flavored shortbread layer, with a cream cheese middle, all topped with crumbles of soft chewy cake. Threee layers, three separate but easy mixing to do. But, hands on, not counting baking time, total hands on effort is only about 10 minutes. Fast, Easy, Nothing complicated and Bingo Bango Bongo, what a treat! And of course you have every right to just nod and smile and refuse to give out the recipe when everyone asks for your secret. Let 'em think scratch when the dive into these wonderful little gems! Press mixture lightly into an the prepared casserole dish. While it is baking, Beat cream cheese, 1 egg, and sugar until smooth. When the "cake" is done baking, allow to cool for 20 minutes. While it is cooling, mix the remaining cake mix with the remaining 1/2 cup oil and egg. Mix until crumbly. Spread Cream Cheese mix over baked layer and then sprinkle reserved crumb mixture over the top. You want that pebbled look, so crumble with your fingers over the cream cheese. Bake for an additional 13 minutes. Refrigerate for 1 hour. Cool completely before cutting into bars. But not just any deviled eggs, these are based on that most delicious of all brunch dishes... Eggs Benedict. I LOVE eggs Benedict. Not just for that marvelous taste, but also it brings back very happy memories of a long gone friend. My good friend John passed away nearly 15 years ago. We had jobs that allowed us to travel a great deal. Whenever we met up for breakfast, you could count on John to tell this slightly off color joke about Eggs Benedict and vacations. I will spare you the off color joke, but just the thought of Eggs Benedict in any style makes me smile. 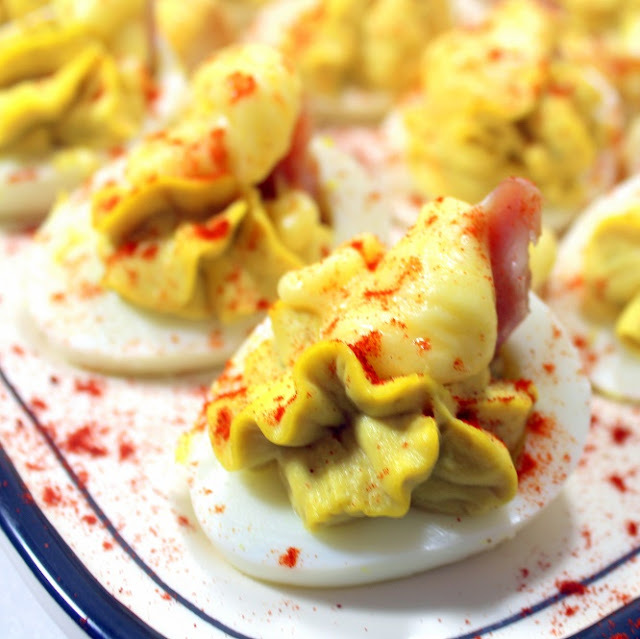 These little gems are destined to be the hit of your event (why do we only serve deviled eggs for events?... they are so good). Just a little bot of ham, a single English muffin, a bit of Hollandase Sauce; and bingo bango bongo, what a treat! The only complicated part of this recipe would be the sauce. Follow the blue letters for my easy to make Hollandase Sauce in a stand mixer recipe. That recipe does make quite a bit, far more than you need for this recipe. I have given you a cut down version of the recipe in this recipe. But plan your menu and you may want to add additional Hollandase Sauce with crunchy vegetables (Asparagus, Bell peppers, etc.) for an additional appetizer or a side dish. 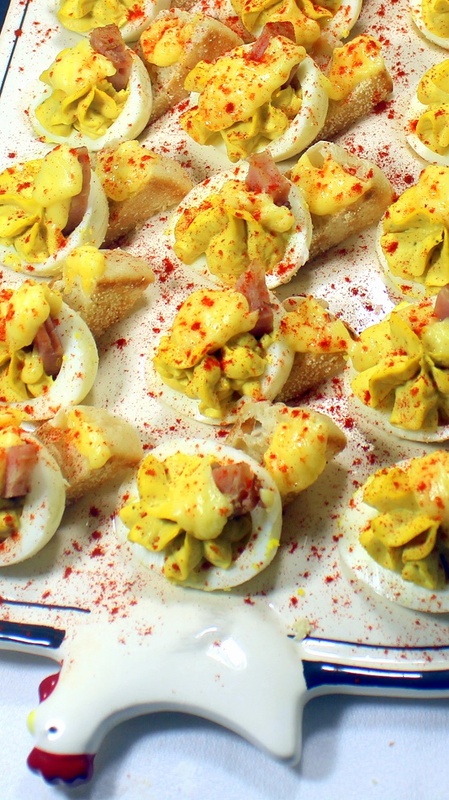 These eggs were gobbled up! 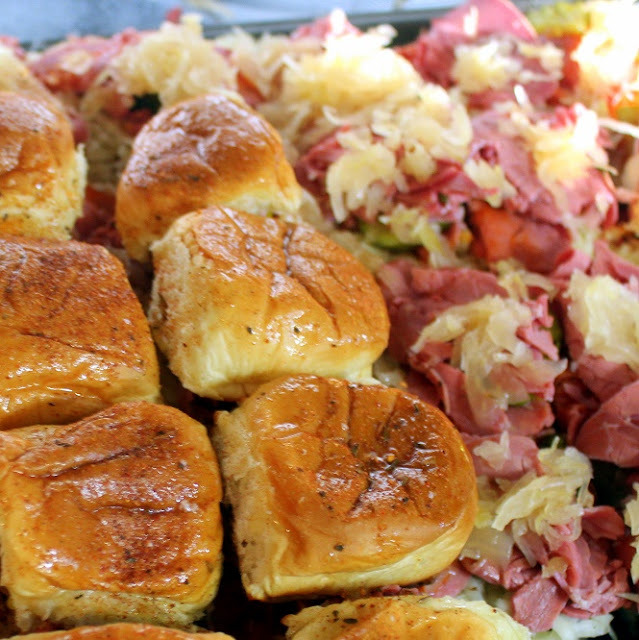 All the flavors and textures of the classic brunch dish. 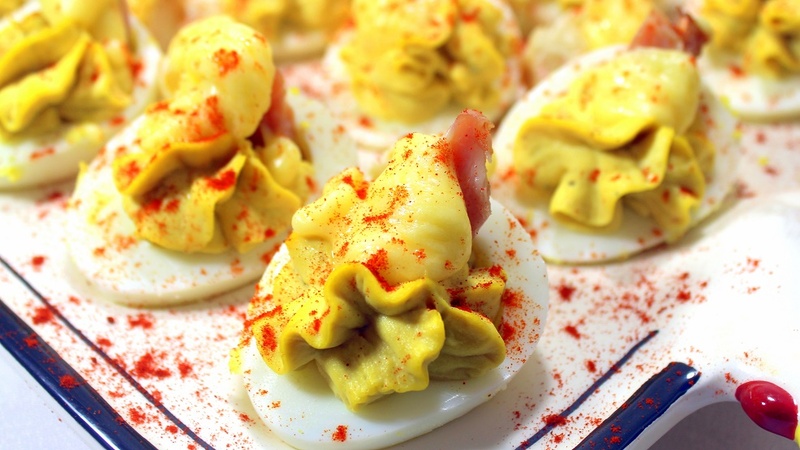 And mu memories will make this a permanent addition to my growing list of All Dressed up Deviled Eggs! 14 Large Eggs, (I always make at least 14-15 eggs just in case some do not peel well... Then I make Egg Salad from the leftovers). Follow the Blue Letter Link for an Easy to Follow Photo Essay on how to peel a dozen eggs beautifully! First to make the Eggs... Place the eggs in a LARGE Saucepan (or two), single layer. Fill the saucepan with cold water a couple of inches above the eggs. Place the pan uncovered under medium high heat and bring to boil. Cover the pan and remove from heat. Let the eggs sit covered in the water for 15 minutes. Drain the water from the pan, immediately fill with cold water. Gently tap each egg on a counter to crack and put them back in the cold water. Peel eggs under cold running water. Once all eggs are peeled, slice each lengthwise. Remove the yolks and place them in a small bowl. Arrange the white parts attractively, ready to fill. In that small bowl, Add the Mayo, Pickle , Mustard, Ranch, BBQ Sauce, Salt and Pepper to the Egg Yolks and mix until creamy. You will need to smash the egg yolks to get the mix creamy. Add additional Pickle relish liquid or Lemon Juice if the mixture needs to be smoother. Add carefully, the yolk goo gets too wet and the piping look will not hold. Transfer the yolk mixture into a piping bag with a large star tip. NOTE: the piped look only works if the yolks are very creamy (you may want to transfer to a food processor to get best results). Otherwise the piping tips will clog. And be sure to use that large star tip. Fill the hollow of each egg making an attractive peal. First, warm the bowl of the stand mixer. I add HOT water to the sink and "float" the bowl in the water. the bowl heats to just the right temperature. Try to not get water in the bowl so you start with a dry warm bowl. Meanwhile, Separate the egg yolks from the whites, discard the whites. Move bowl into locked position on the mixer. Add the yolks and start whisking on medium speed for 1 minute. Add the Lemon Juice and continue to whisk for 5 minutes. Now, add the remaining ingredients except the butter... Water (drizzled in slowly while the whisk is running), Salt, Pepper, Tabasco and Cayenne. Whisk for another 5 minutes until the sauce is thickened to the consistency of heavy cream. Thick enough to leave a thin trail as the whisk runs. Next, SLOWLY... Slowly (important enough to say it twice), drizzle the butter into the egg mix with the whisk attachment running. Continue to run the mixer on medium high speed until all of the butter is added. Continue to whisk for 5 minutes until the sauce is thickened even more and there is no hint of a separation. Add the English Muffin wedge, slide it under the portion of the egg with the ham piece. NOTE: Do this step just before serving so the wedge does not get wet and mushy. Arrange on a serving dish and drizzle with the Hollandase Sauce,. Store loosely covered with cling wrap. 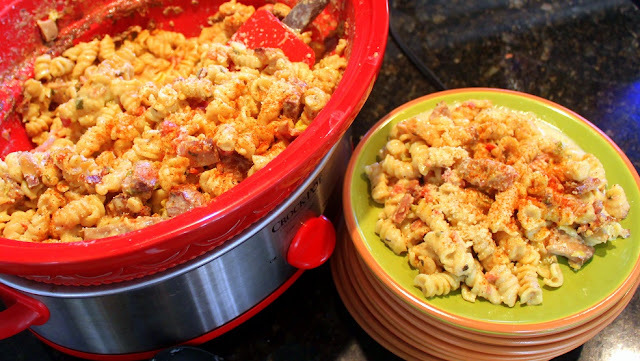 But not just any left overs, this Tuscan Ham and Pasta is the perfect post holiday "dump in a crock pot and keep it warm to graze all day" dish. Warm, hearty and filling, efficient use of left overs, but certainly a respectable dish on it's own. My post holiday was spent with a small group of family lazily lounging around hunting for something to binge watch on TV. There was a larger group that hit the stores for the post holiday frenzy of sales and returns. Our lovely day of family togetherness was finally over as we settled into the true meaning of Christmas (insert ironic shake of head here). But what remained was a need to feed both branches of the post familial Holiday experience. Very simple and fast to make (20 minutes, really!). 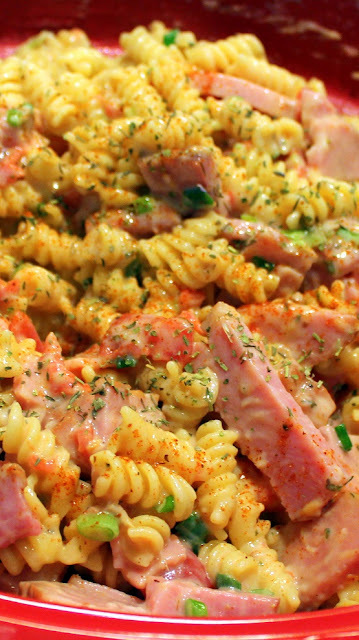 Primarily a simple pasta dish but the meat of the dish is the left over holiday ham (works with turkey as well). I included in the recipe a frozen spinach ingredient. Feel free to dice up that bowl of leftover creamed spinach if you have it. Got left over peas... dump them in too (especially if there is bacon in your pea recipe). You get the idea. A wonderful use of left overs. One note, I put mine in a crock pot so everyone could graze as the day wore on. Watch the pot, the pasta can dry out pretty quick if you set the heat too high. Every few hours I will add a bit of Half and Half and more Cheese to the mix. Good for another few hours of our Breaking Bad marathon! Enjoy indeed and Happy holidays! In a Large Skillet, Place the oil, garlic, spinach, and onion. Saute over medium heat for 5 minutes. Meanwhile, prepare the pasta according to the box directions, EXCEPT, prepare al dente, cooking one minute less than suggested on the box. Back to the skillet, add the Herbes, Tomatoes and Chicken Stock. Increase heat to medium high. Allow the mixture to come to a boil, then stir. Add the Ham and stir. Allow the sauce to simmer until the pasta is finished. 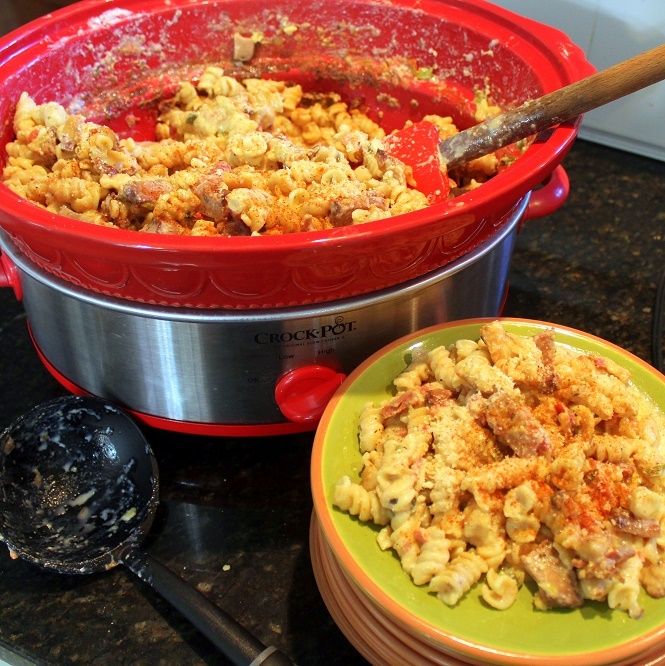 Drain the pasta, return the pasta to the large pasta pot. Add the sauce and stir to combine. Add Parmesan Cheese and stir until melted. A Proper Drink... The Untold Story, Told HERE! Oh Boy... A Book to read! And my opinion... I LOVED THIS BOOK. 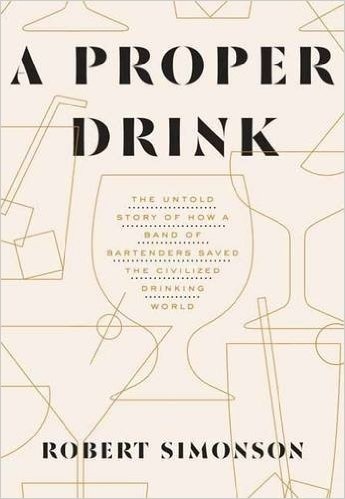 A Proper Drink: The Untold Story of How a Band of Bartenders Saved the Civilized Drinking World is the story of New York and the other drinking capitals of the world in the late 80's and early 90's as told by the bartenders who lived beyond the age of the sweet and sour mixer drinks of the 70's and introduced an all new golden age of the cocktail. The book is full of first person accounts of underground bars, secret buzz words to get mixologists enthused and the after hours get togethers to spread the new gospel. Here's what the publisher has to say... "A Proper Drink is the first-ever book to tell the full, unflinching story of the contemporary craft cocktail revival. Award-winning writer Robert Simonson interviewed more than 200 key players from around the world, and the result is a rollicking (if slightly tipsy) story of the characters--bars, bartenders, patrons, and visionaries--who in the last 25 years have changed the course of modern drink-making. The book also features a curated list of about 40 cocktails--25 modern classics, plus an additional 15 to 20 rediscovered classics and classic contenders--to emerge from the movement.". Written by the Cocktail and Drinks writer for the New York Times (WHAT A JOB!!! ), Robert Simonson. Mr Simonson was there for the revolution and writes with the energy of as true convert. The Fru Fru wine and fake fern bars have been replaced with adventure and this book leads the cheer. It has changed the way I go out. No more beer and shot orders for me, now I am looking for ther legendary Sazaracs and Nigranos, but also searching for the mixologists who are experimenting with their own creations. Always harder to find than a cold one, but so much more rewarding when you get a good one. Love the stories and could not recommend the book more. A toast to the adventure that starts now! Here's the legal stuff... "I received this book from Blogging for Books for this review." But the review and opinions are 100% accurate and mine!". I look forward to making many more of the beautiful drink recipes offered! Love this book and highly recommend it! I am so thrilled to add this book to my library. A terrific inspiration. As a gift or a new reference book for yourself, this is a keeper. 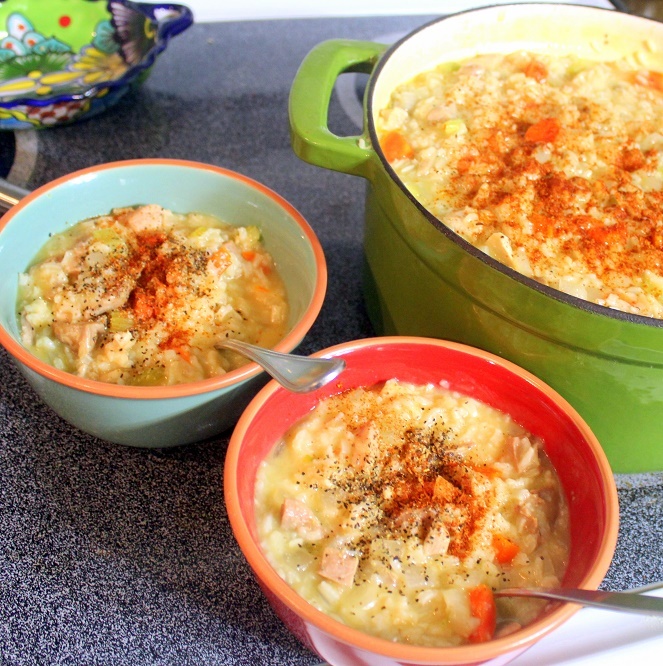 But not just any Soup, this is made from Turkey Day left overs! The consistency is kind of a soupy Jambalaya. In fact the recipe sounds very similar to a Jambalaya. But we become French when we add the Carrots in place of the Cajun Bell peppers. We add a creamy broth with the addition of Half and half, but the look will certainly remind you of the classic Cajun dish. I am not sure why this is called a Williamsburg Stew. I tried to do a little research, but mostly I came up with a beef stew. But, I adapted the recipe from a very old Southern Living cookbook. So , we'll stay with their title and call my adaptation a Williamsburg Stew as well. I especially like the idea of using leftovers right away. 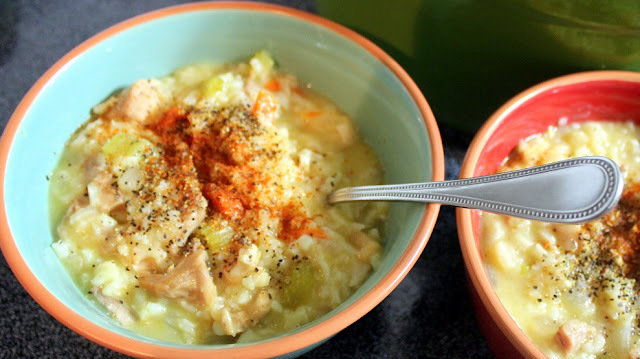 Love Love Love turkey on the day, but there is something special about a steaming hot bowl of soup from a BIG pot on the next day. Lots of coming and going, set this on the stove and relax for the day. Not much of a trick at all to make. I do love using my beloved ceramic lined cast iron dutch oven for this. 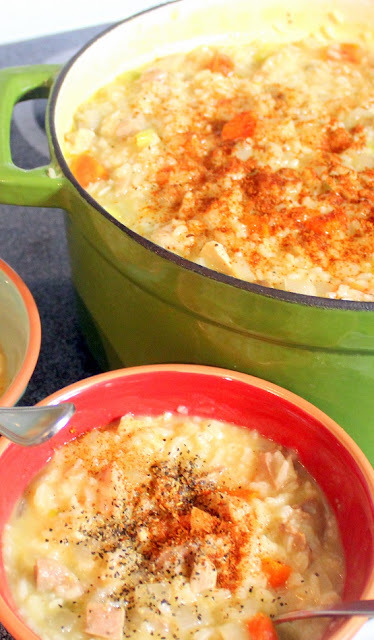 Simply the best for soups and stews. The one listed below has all the bells and whistles without the couple of hundred dollar price tag that comes with some of the best dutch ovens. Heavy, easy to clean, Ceramic non stick lined, Cooks beautifully with even heating all around and beautiful. Remember, free shipping from Amazon on orders over $25. Keep scrolling down, easy to follow recipe to follow. Place turkey carcass and water in a Crock Pot, set the setting on low and cover. Simmer for at least 4 hours, but you can simmer for as long as 24 hours. Heat butter in Dutch oven; add flour and cook over medium heat stirring constantly 5 minutes. 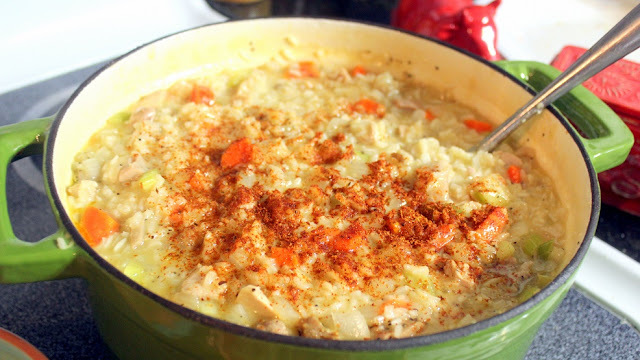 Stir onion, carrot and celery into roux; cook over medium heat 10 minutes, stirring often. Add minced garlic and stir to mix. Add broth, turkey, rice, salt and pepper; bring to a boil. Cover, reduce heat. Simmer 20 minutes. Add half and half. Heat through. Season with Salt and Pepper to taste. Add Cajun Spices to taste. Garnish top with additional Pepper and Cajun Spices for color. But not just any ham, this is a delicious holiday ham worthy of any Martha Stewart want to be's table. yet it is also just about the easiest of any spectacular Holiday Main Course. Roast and forget, add a glaze for the last few minutes of cooking and you get the Oohs and Aahs from your doubting delighted family! Almost all hams come pre-cooked these days. 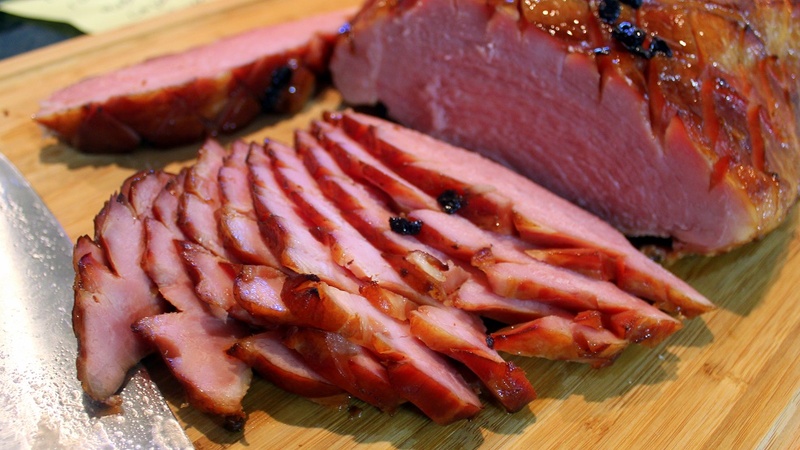 Many even come pre-smoked, adding an extra layer of deliciousness before you even unwrap the ham. All you are really doing is warming the meat. No need to worry about poisoning the entire family with under cooked poultry. You only have one worry. And that is to NOT overcook the ham. Once the temperature inside the ham reaches 140 degrees, any additional heating will only dry the ham out, Sweet moist and tender is the goal... Internal temperature inside the ham of 140 degrees is the goal! 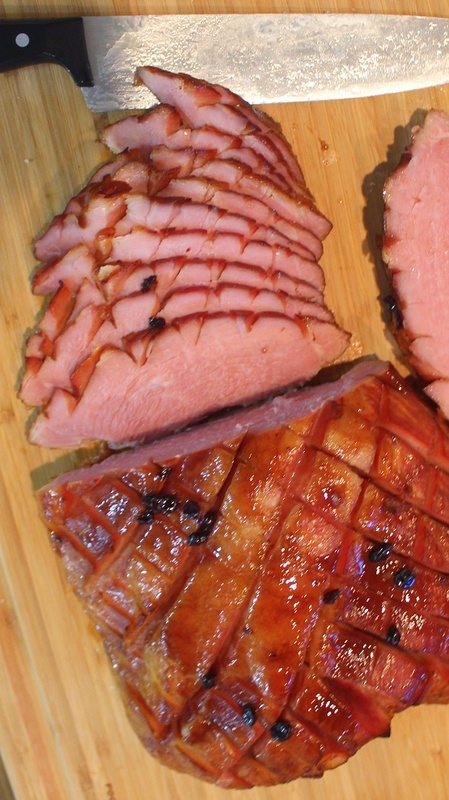 The glaze will make your ham glow! a Beautiful color, a delicious coating that will add just a tiny bit of carmelization (the crispy parts) to the texture! It is very easy to make and again... Thrilled guests! There are lots of ways to measure internal temperature for meat. Go ahead and pop for a thermometer. You will be amazed how often you use one once you pick one up. That beautiful medium rare look for steaks. Best way to insure that is with a remote probe. More to point, best way to get a sweet juicy beautiful ham... Use that probe! Proper temperature of your hamis the single most important aspect to cooking a turkey. Far more important than organic or free range or any of the expensive key words. Buy a remote probe, not an expensive ham... More bang for your bucks. 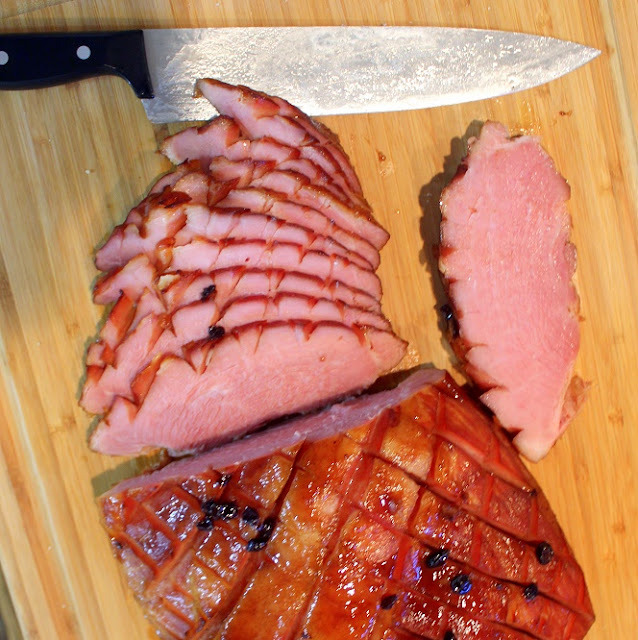 "Score the Ham" Meaning take a sharp knife, cut diagonal into the ham about 1/2 inch deep. Turn ham and repeat, making diamond pattern. Do your best to cut equal size cuts apart. Set a flat wire rack in a large roasting pan (preferably with a domed lid) and pour 1-1/2 cups water into the pan. Put the ham cut side down on the rack. Cover with the pan’s lid or put a small piece of parchment on top of the ham and then tent with heavy-duty aluminum foil, pinching it over the lip of the roasting pan for a good seal. Roast until an instant-read thermometer inserted into the center of the meat registers 130°F, 2 to 2-1/2 hours. In a small sauce pan, combine all of the "for the Glaze" ingredients. Heat over medium low heat stirring to combine. Continue to cook, stirring every few minutes to a low simmer. Remove the pan from the oven; turn the oven temperature up to 375°F. Transfer the ham to a cutting board; remove the rack from the pan. Drain the liquid from the pan and discard, or save it for another use. Set the ham cut side down in the pan. Using a brush, slather the glaze all over the exposed parts of the ham. Cook, basting twice, with the glaze until caramelized at the edges and an instant-read thermometer inserted into the center of the meat without touching bone registers 140°F, 15 to 20 minutes. 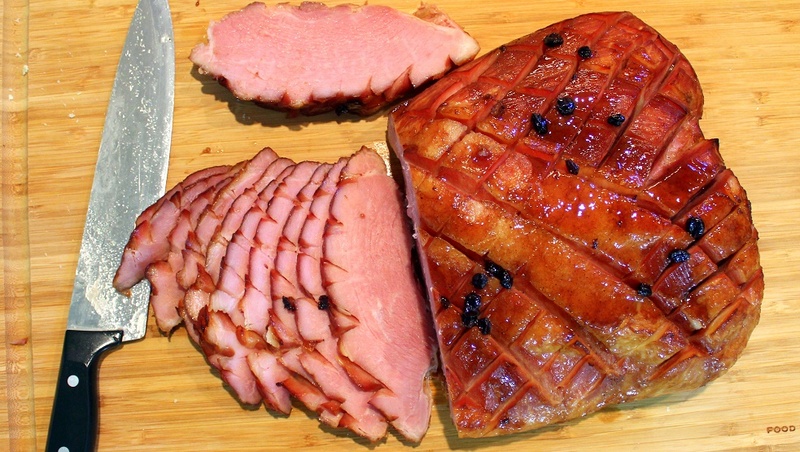 Transfer the ham to a carving board and let rest for at least 30 minutes and up to 2 hours before carving. NOTE: Be humble and gracious but do bask in the glow of your doubting family members! But not just any turkey, this is the MOST IMPORTANT single item on your Holiday table. Serve a "rare" under-cooked bird and you risk poisoning your entire family. Serve a bird that has been overcooked and you have something dry and painful to swallow. Either way, you will become the talk of generations to come. OK, that's the bad news. the good news, a turkey may be the easiest item to cook on that holiday table. It's all in the timing, all in finding the correct temperature. You may see dozens of recipes with complicated Brines, loading the bird with "aromatics" (Onions, fennel, Apples, etc) and then spend only one sentence about serving a bird at the right temperature. Well my brothers and sisters of the order of the oven mitt, I am here to tell you that a bird cooked this way (simple and easy), cooked to the right temperature is FAR FAR better than that fancy brined bird cooked with those aromatics. There are lots of ways to measure internal temperature for meat. Go ahead and pop for a thermometer. You will be amazed how often you use one once you pick one up. That beautiful medium rare look for steaks. Best way to insure that is with a remote probe. More to point, best way to get a sweet juicy beautiful turkey... Use that probe! 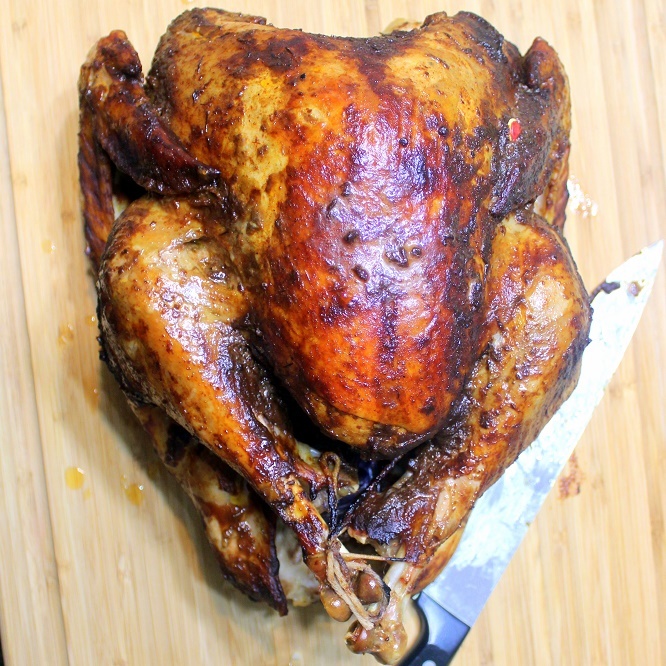 Proper temperature of your bird is the single most important aspect to cooking a turkey. Far more important than organic or free range or any of the expensive key words. Buy a remote probe, not an expensive bird... More bang for your bucks. Buy a 12-15 pound turkey (no bigger). 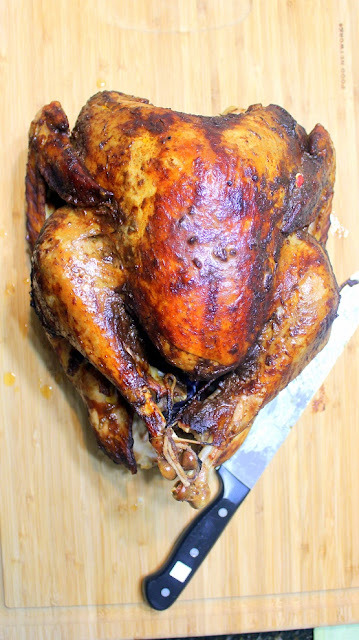 Note: Butterball is fine, but just a plain basic turkey works just as well. pat dry with paper towels, then let stand at room temperature, 30 minutes. Preheat the oven to 300 degrees. Meanwhile, Season the turkey inside and out with salt and pepper. Tie the legs together with twine. Place breast-side up in a roasting pan and brush with melted butter. 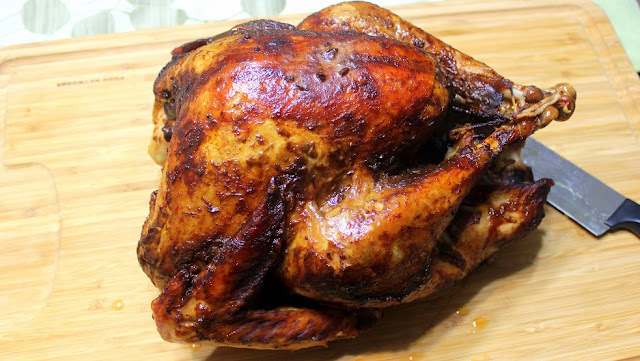 Tent with foil and roast 2 hours for a 10-to-12-pound turkey; add an extra 15 minutes per pound for larger birds. Note: to tent the bird, pull out a sheet of aluminum foil a little longer than the length of the roasting pan. Make a fold lengthwise (so it looks like an old fashioned Boy Scout tent). Put this loosely over the bird, touching the actual bird as little as possible. This tenting will hold the moisture in so the bird will steam itself from the inside out, insuring a moist and tender bird. When the tempis reached, Pull Bird out of the oven for a few minutes so you can brush on a coating of butter or BBQ Sauce. Brush coating the entire bird evenly. This is the part that turns that beautiful golden brown and delicious look. Work quickly, you do not want the bird out of the oven long. Increase the heat to 400 degrees F; roast until the thigh meat registers 165 degrees, about 30 minutes. VERY IMPORTANT: Once the bird reaches 165 in the thickest part, the bird is done. If you have one of those pop out things, ignore it. Those are designed to pop out at 180 degrees, or once your bird is dried out. Let rest 30 minutes before carving. Note: Leave on the roasting rack, loosely tented. This gives the bird time to relax, allowing the juices to be reabsorbed into the bird, insuring a moist and tender bird. 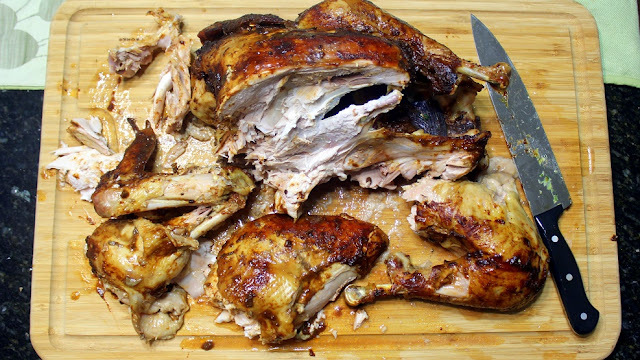 If you carve too early, most of the juices run out and the meat dries out quickly. But not just any Reubon Sandwiches, these are a spectacular version with all the classic ingredients of the only "invented Sandwich". All that's missing is the Rye (I like to make my sliders with Hawaiian Rolls). I made these for an after Church social hour. 48 little bitty sandwiches (a couple of bites each) and bing bang boom, they were gone in a flash. 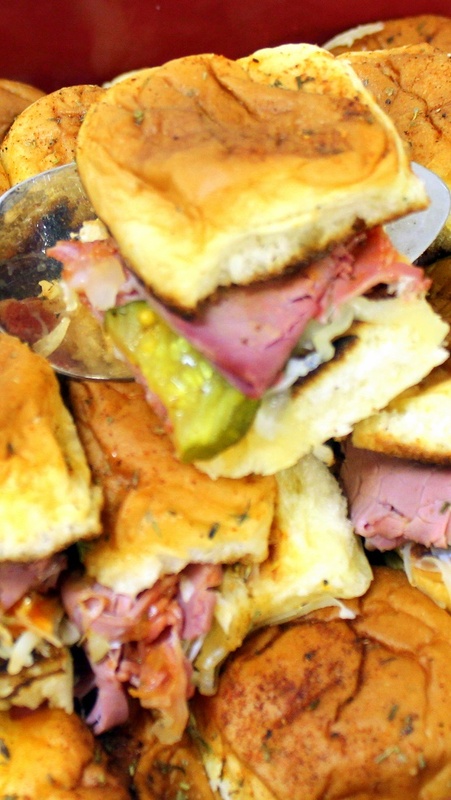 Everyone loves Reubens! It's very easy and fast to make these. I like to toast just the middle of each sandwich. 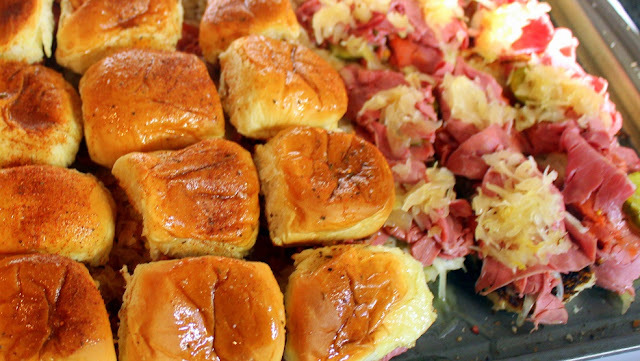 Adds a bit of stiffness so the very very soft Hawaiian rolls stand up to the bites! It also helps to melt the cheese that holds everything together. 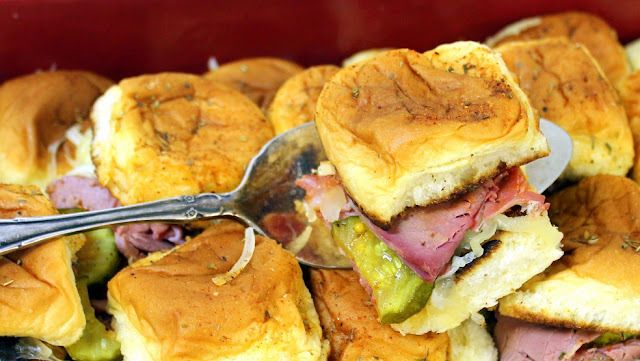 These are designed for a fun night, the sandwiches are separate, but the gooey melty cheese links them all together so pulling them apart is part of the fun. Carefully slice the Hawaiian Rolls in half. Be careful to not mush them with too much force. use a good bread knife and let the knife do the cutting. Separate each bun. Arrange tops and bottoms, cut side up on separate cookie trays (remember to arrange so you know which top goes with which bottom) on a cookie sheet, toast both sides, the cut side up. I set the oven to broil and toast for just 2-3 minutes. Watch them so they do not burn, just a nice toast. Add the tops. Brush with melted butter and generously sprinkle with Parmesan Cheese and Herbes de Provance. But not just any mini muffins. 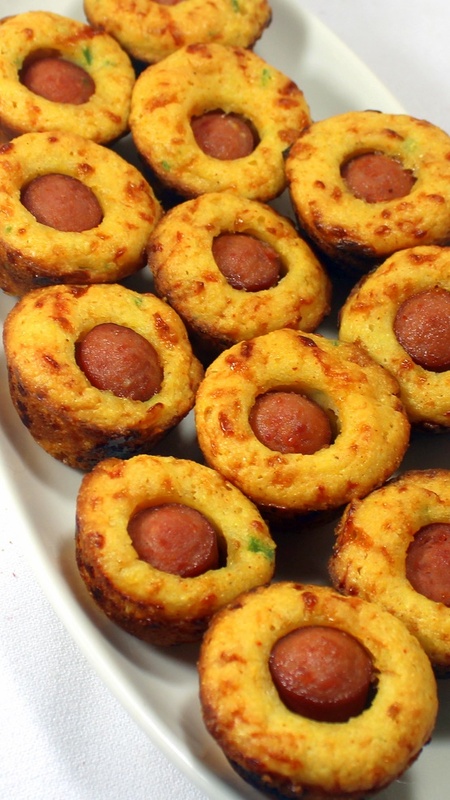 These are a wonderful cornbread recipe with just a bit of all beef hot Dog stuffed in the center. 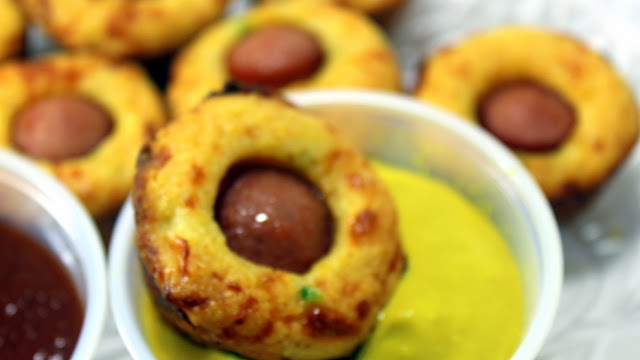 Colorful and wonderfully tasty (The cornbread is LOADED with bits of Jalapeno Peppers and Cheddar Cheese), these will remind you of the Corn Dogs of your youth... Just LOTS better. I was indeed pleasantly surprised at just how good these were. Adding a ramekin of BBQ Sauce and of Mustard added to the fun. But really, the taste is top notch. 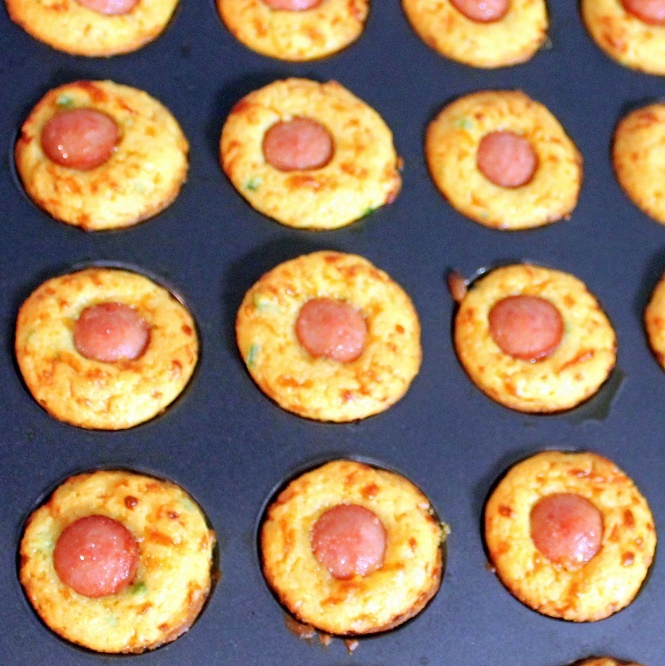 Making a fun dish for the kids into a terrific tasting dish for the biggins too! I have lots of recipes on this blog for mini muffins. Sweet, Chocolate Chip, Savory, Cheddar Garlic, Traditional lemon poppyseed to well... Corn dogs. I have a recommendation to make if you become fascinated with the idea of bite size treats for yourself and to give away. All of my recipes make 48 muffins. Just the right amount for a serving or two for a family or a Big Family get together pot luck or enough for you to enjoy and to give a couple dozen away. Wilton makes a perfect pan for any of these muffins. No need for paper liners, the pan is non stick (although I always spray with non stick spray anyway). Just the right size for your oven (only have to bake once). and a heavy feel to the pan for even baking. Could not recommend this more. One of those kitchen gadgets that is worth every penny! No one is paying me for this ad, I just really like the product and use mine often! 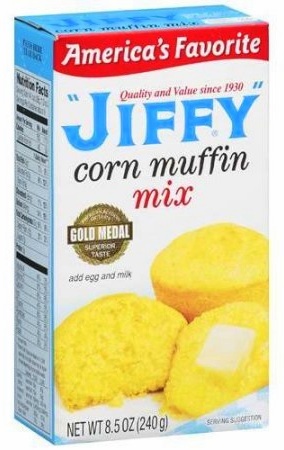 Add 2 TBS of batter into each of the Mini Muffin slots. 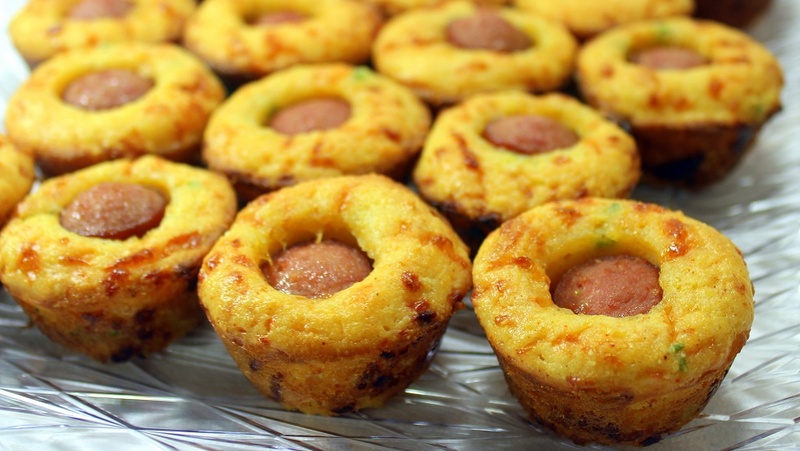 Stand q piece of hot dog in the center of each muffin. Bake 20 minutes until the top starts to brown. Serve Warm ... and ENJOY! 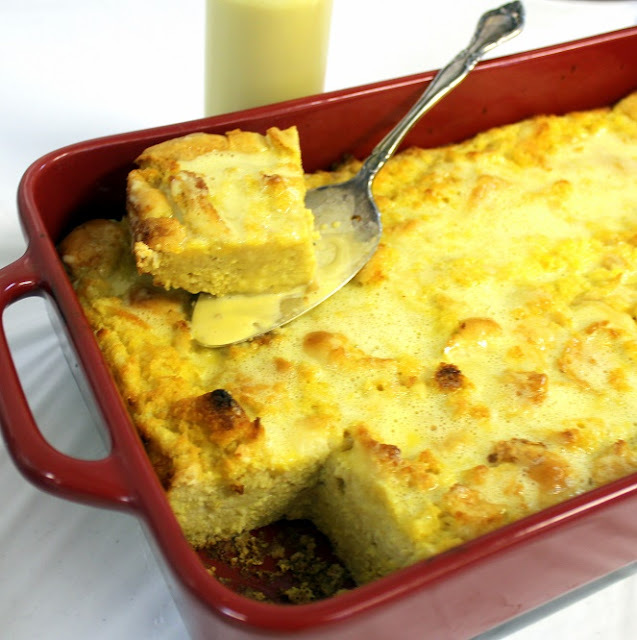 Nut not just any Bread pudding, this bread pudding combines a couple of my favorite things. A seasonally special ingredient, The Nog of the Egg! Plus the base is totally made from leftovers that would have been tossed in the garbage. Somethin Special from Nothin... PRICELESS! 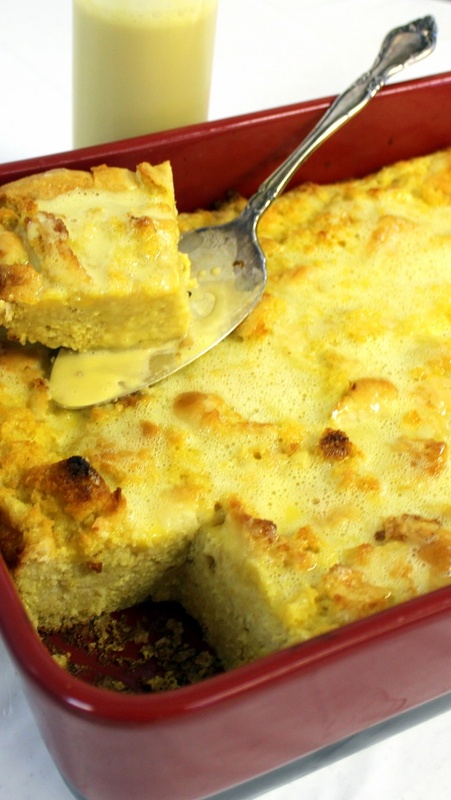 This bread pudding was made from leftover dinner rolls I had from Thanksgiving. 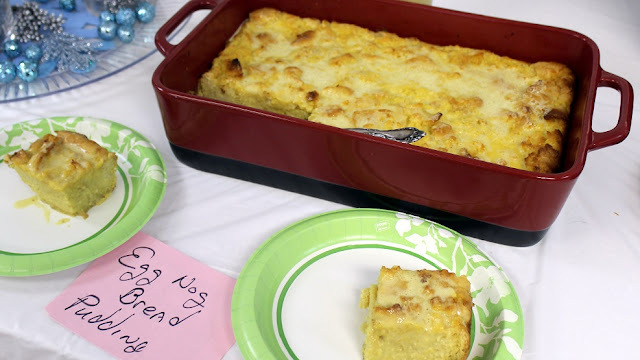 Bread pudding has evolved recently into something that is made for special occasions when in reality Bread Pudding was always a leftover dish. Let your bread get stale and you have the makings of a dessert rather than trash. The rest is pretty much standard. I did use Egg Nog in place of the "normal" milk used in most puddins. Add a little nutmeg and cinnamon for spices and you have this simple, easy to make but plenty to please dessert! Happy Holidays, Merry Christmas and of course... ENJOY! 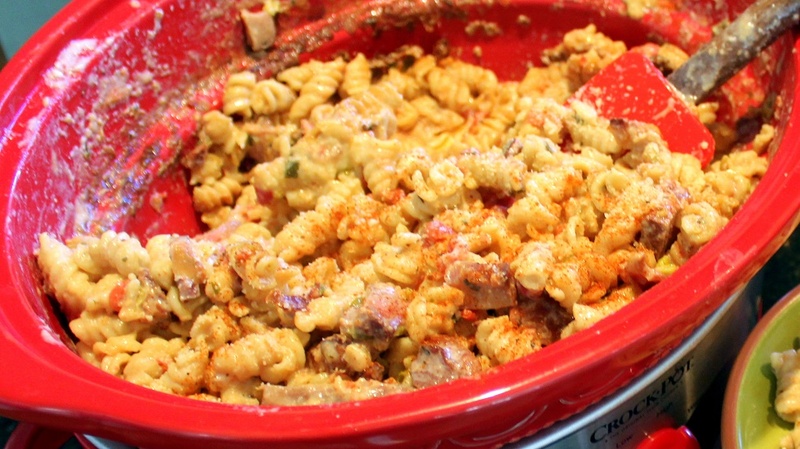 Prepare a 9X13 Casserole pan with non-stick spray. Place cubed bread into a large bowl then set aside. In a separate bowl, beat together the eggnog, eggs, brown sugar, cinnamon and vanilla until completely combined and the sugar has dissolved. Pour eggnog mixture over bread cubes then toss lightly to coat. Spoon bread into prepared casserole dish then drizzle with melted butter. Bake 40 minutes or until the custard has set and the top just begins to turn golden brown. Remove from oven then set aside to cool while you prepare the sauce. FOR THE SAUCE - In a medium-sized bowl, whisk together egg yolks, sugar, Bourbon and salt until blended and smooth (Note: Add Vanilla in place of the Bourbon if making a non-alcoholic sauce). Add heavy cream to a small saucepan then place over medium-low heat until steaming, but not boiling. Whisk egg yolk mixture and begin slowly drizzling in ½ cup of the hot cream. Do not rush this process, and be sure to whisk constantly. The point is to slowly warm the egg yolks without cooking them. Once half of the cream is blended into the egg yolk mixture it should be safe to pour in the remaining cream while still whisking. Blend everything thoroughly then return the entire mixture to saucepan. Place saucepan over medium-low heat and cook the vanilla sauce, stirring constantly, until it thickens to the point that it will coat the back of a spoon. The sauce will be done just before it begins to bubble, so if you see a bubble form, you know it’s ready. 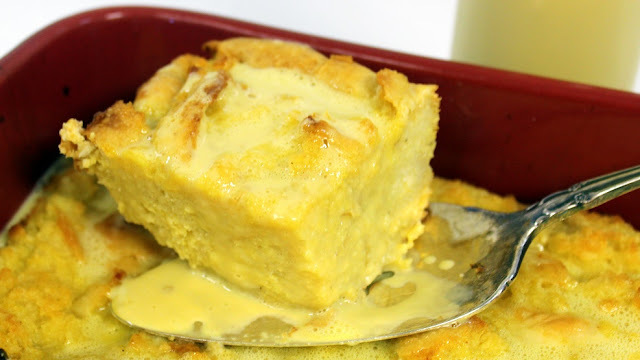 Serve the sauce warm, or at room temperature drizzled over a nice thick slice of the eggnog bread pudding.